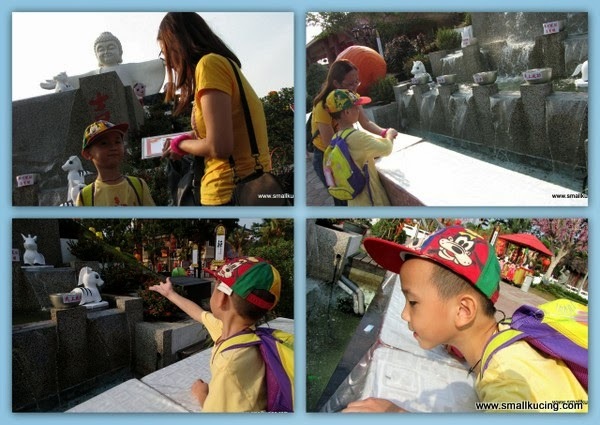 Mamarazzi have wanted to visit Fo Guang Shan Dong Zen Temple during Chinese New Year for many years already as she heard that the place are decorated very nicely at that time of the year. Only this year did we managed to pay the temple a visit on Friday, the 8th day of Chinese New Year. She choose to go on Friday coz it's a working day...should be less people there. I slept a bit in the car. When we arrive, Mamarazzi woke me up. Hmm....goody. found parking easily. No problem there. Problem was getting me to smile and look at the camera for the first few photos as I was grumpy. Hot and sleepy. I have a particular angpau to donate to the temple. Hopefully it would do some good instead of otherwise. Mamarazzi didn't notice at first but Donation boxes were plenty around the temple compound. It sure did some "good" to me as next to the donation box was and ice cream counter. Mamarazzi bought Papa and me each an ice cream. Super yummy on such a hot day! Naughty Papa....he finished off his ice cream and wanted to have a bit of mine. hand over the ice-cream or I shoot you! Please take note "DO NOT LITTER. DO NOT SMOKE, MAY BUDDHA BLESS YOU"
Haiz....now Mamarazzi at work pulak....Faster snap la...hot dei! Or I'll turn into Tiger and bite you ah....ROAR! Hmm...Is it a wishing fountain? saw many people trying to throw coins into the bowls there. "Bodek" Mamarazzi for some coins. Maybe I'll try this Bell with better luck. Errr...not for wishing ah...for making a Vow? First step ..Join Palm together..make a vow...strike the bell.....DONNNGGGGGGG! Next went to Lumbini Garden. Wow...scenic place. There was a pond there with fishes. Plenty of flowers and orchids. Mamarazzi saw this "bulat"type of bamboo. So cute. Like shape of a gourd. Nowadays whenever Papa and Mamarazzi try to get me to smile for the camera, I would give them Donald Duck smile....look same or not? Next we went to another part of the temple. It's fill with decoration of things from under the sea. There were helpers there who selling wishing cards . Many people buy and hang it up the trees. Scenic place.....too bad my Mandarin is only up to reading numbers coz saw beneath the statues which were behind me there were dates....1st to...30th or was it 31st....and each have some writing on it. Mamarazzi was wondering what are those...maybe like horoscope? Telling about the characteristic of people born on those dates? The orchids there were HUGE....some are as big as the size of a child's palm. Mamarazzi really envy the blooming "Sau Kau" flowers(the blue and pink flowers). As far as she know, it's very hard to get those flowers to bloom. Really tiring walking around. Lucky for us, mamarazzi was clever. She brought along ice water for us to drink. Too bad she didn't thought of bringing some food as the food there were quite pricey. This plain fried bihun cost RM5. Portion pretty small too. And the box of "nasi Lemak" with vegetarian Char Siew cost RM7. Kinda weird having "nasi lemak" with char siew. Lucky for us the Ice Blended drinks at the 1st stall were not that price. RM5 a cup while another stall in the middle was selling ice blended drinks at RM8.80 a cup. By the time we finished "dinner" , it was 7.30pm. The crowd had started to built up . Lights were on. There were performance on the stage by school kids and various groups. While performance were going on, volunteers walked around giving empty angpau packets to the audience to be fill up. Later another volunteer came to me with a big box. Silly me...I thought she was giving me pressie and I took the box. Then the lady said no no no....it's for me to put in the "filled up" angpau. It's a donation box. There was dragon dance by school children too. I got a sweet from him. We didn't wait for the performance to end. Walked around some more. And many with my "donald Duck " smile. Yup...It's hard to get me looking directly at the camera and smile naturally. Mamarazzi just have to pakai hentam and keep snapping photos and maybe one or two out of the many will turn out okay. And this one...not bad ya? It's worth a trip there. You still have time to go as it will be on till 16th February 2014. After that, guess you will have to wait for next year then. Woi, mamarazzi! You look so young, actually how old are you? Talking about hot, yes, the weather nowadays very hot, can't live without the aricond.. The aircond is basically on 24 hours a day.. Every morning, wakeup aje, terus on aircond leh.. Behtahan.. Walk a few steps only already berpeluh.. Haha, kam ngam the ice cream counter is nearby, so am sure most people bought ice cream after that, since the weather is so hot..
Eh, that bamboo looks unique, tak pernah tengok.. Reminds me of Lady Gaga punya layered hair at one time.. kekeke..
Woi not mouth sweet la.. Is really one.. You never hear me say SK or TM look young kan? OMG, I hope they are not reading this, kekeke.. I scared TM gag me with smelly socks and then throw me into jamban..
Eh wait, why we always say jamban ahh? Other than jamban somemore can say what? Good morning.... maybe could be better to go in the evening in this hot weather.. nice photos! They have it every year? Hahaha...no la....tarak ngum go for retreat there la for us. Guess it's for the temple la the proceed. Kira as donation lor. Got ask for number? Come, come...give me, quick! 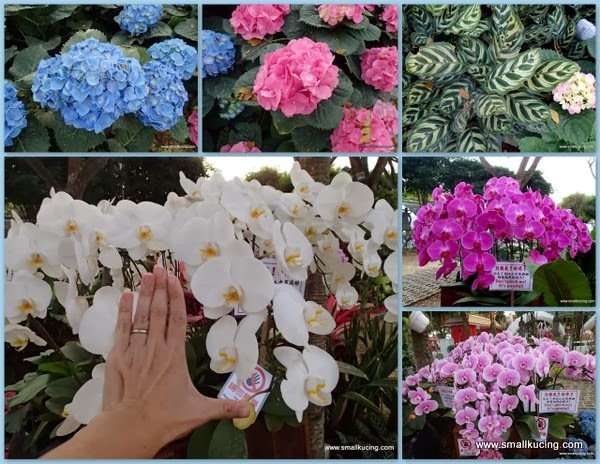 show hand so that can compare the orchid size mah. Nice shot. Poor small kucing. Sleepy still have to pose for camera and some more blackmailed by papa. Haha. Indeed a very interesting and worthy trip. Ini Kucing family sure have lotsa stamina one! Can tahan one day like that! LOL...ya ka??? If got run no problem right? Such a lovely place which I didn't know existed. I shall try to go too. Heh heh... drive past that place all the time (masa balik fahzer punya kampung); never stop long enough to look, haha. we blog about the same thing haha! wow, such an interesting place. maybe I should make a trip there. The last photo of Small Kucing is very nice! All due to Mamarazzi being so patient and took so many photos of him. Seems like a nice place to visit during CNY. Whoaa!!! Anay loves the photos in this post! Semua happy and colourful ones! Good boy and heavens will bless you for doing charity! So must donate every CNY ok..
Eh! I saw Kaldip! He was smiling like a cute boy! You lucky to have such an active Papa & Mama who love to visit & eat everywhere!!! I feel malu that I have not visited so many places that Small Kucing has visited! I believe I will enjoy that place as I love such places with colourful lights macam Fairyland! wow looks great, no go 5 yrs already!